We’ve had the good fortune to camp in some pretty fantastic locations. Jervis Bay on the south coast of N.S.W. stands out. 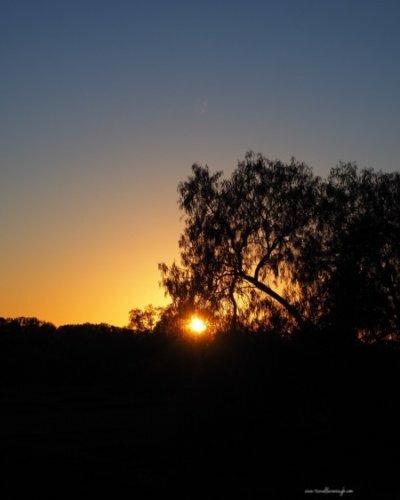 In America, Canyon of the Eagles and the Davis Mountains, Texas were two of our favourites camping destinations. While all great experiences, there were almost always lots of other people around. Folks walking back and forth to the restroom facilities. Late arrivals flashing their headlights into the campsites. The inevitable swearing as they fumble in the dark trying to pitch their tents. Plus, some of these places are darned expensive to stay in for a few days. That’s why we were so excited to try “Free Camping” in our campervan rental. It really doesn’t cost anything (or costs very little). The best part, free camping allows you to park just about anywhere. Generally speaking, you’re free of people, free of noise, and free of any unnatural light except what you create yourself. It’s as close as you can get to nature in a campervan that you can get. 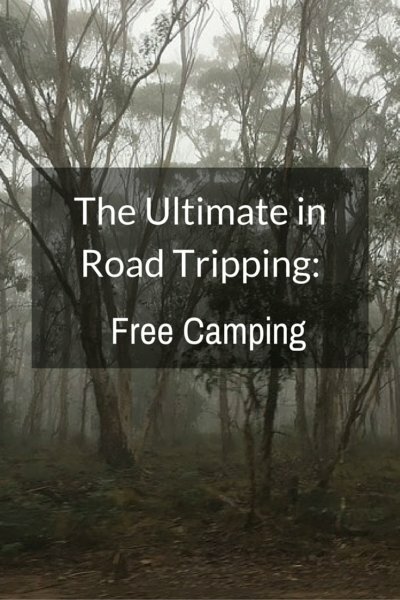 Because of the sheer vastness of Outback NSW, free camping is really easy to do. (As soon as you get over the heebee jeebies of nearly complete isolation). 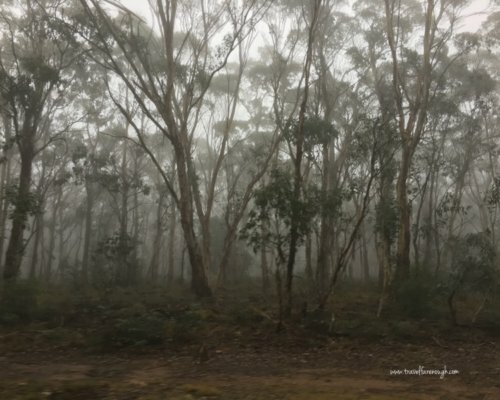 That’s where we found ourselves for our first try at Free Camping–20KM from the main highway, deep in the Aussie Bush in Kanangra-Boyd National Park on a rainy Saturday night in June. We let our imaginations run away with us. Instead of living in the moment, we succumbed to the fear of ‘what if’. T: Where do you want to park for the night? R: There’s a nice stone shelter and dry firewood. The fireplace looks cozy. Why not here? T: The bathroom is pretty far away down a rough track. R: Okay. Well, it’s Saturday night. What if the local hoons come, ready to party? It would ruin everything. T: Yeah…we really don’t want to get caught up in that. OK, let’s park away a bit. We move the van about three spots away—50 feet at best. T: It feels too exposed here. And the toilet is even further away. R: Do you want to try the other side? We’d be well away from the hoons if they did show up. T: Yeah. Let’s at least check out the toilets. So, we hopped back into the van and made our way to the other side of the campground. After wasting about 45 minutes nit-picking about the ideal camping spot, we had one of the best nights we’ve ever had roadtripping. Turns out the facilities were not only safer to walk to, but came equipped with a decent roll of t.p. Score! So settled, we got down to the business of camping. I collected (what I thought to be) plenty of kindling. I had a brand new pack of fire starter and some semi-dry wood we brought over from the stone shelter across the road. Thus equipped, I attempted in vain to light a fire in the rain. I sat hunched over the damp wood with newspaper; the rain dripping down my arm was not really helping at all. This was clearly a bad idea. Meanwhile, Tara was busy trying to catch the van on fire burning some hamburgers. Not only had she not cooked on gas for over two years, but she was cooking within a confined space due to the rain. There was so much smoke, she had to disable the smoke alarm. That thing was super loud ! The rain was increasing and I had wasted half a pack of really expensive fire starter with nothing to show for it so we settled into the van with a glass of wine and our books after a delicious dinner. The only sound was the pitter patter of rain on the roof top. The hoons were long forgotten. (They never showed up. If we had only put aside our fear of the unknown, imagine how much better our experience might have been.) Neither one of us questioned our security. 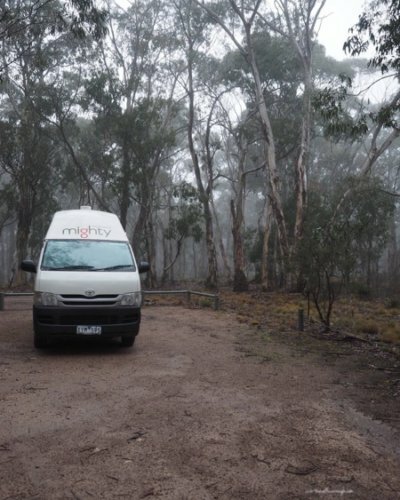 The complete absence of anything but the bush allowed us to feel safer here than we ever have in a caravan park. I can’t remember the last time we enjoyed such quiet surroundings. Talk about getting away from it all. 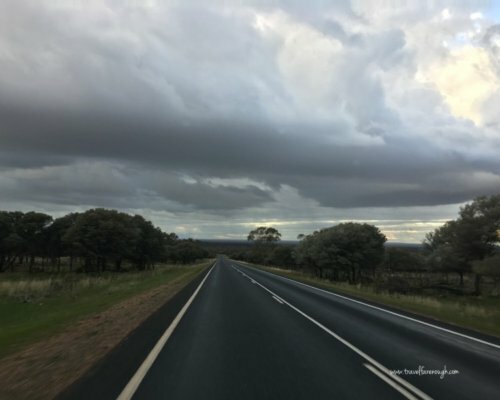 We had planned on free camping at Mutawinji National Park with our National Park pass, but it was closed due to the weather, forcing us to stay in a Caravan Park in Broken Hill. That was a real bummer because this caravan park shows why caravan parks get a bad rap. We were packed in like sardines. We had maybe a metre between us and the next guy. Someone had already set up in our assigned spot, so we had to go back to the office to tell them the lot number that was available. Loud music blared. Trash was littered all over the grounds. We were lucky to find a new spot actually; there were just a few spaces left. Nevertheless, we could shower in the semi-clean facilities and resupply the Mighty Rattler with water and electricity. The next morning, we topped up on petrol and supplies in town. Our plan was to drive to Cobar to spend the night before heading back to Sydney. We weren’t exactly looking forward to another campground, but we’re new to the campervan idea and really didn’t know what other alternative we had. 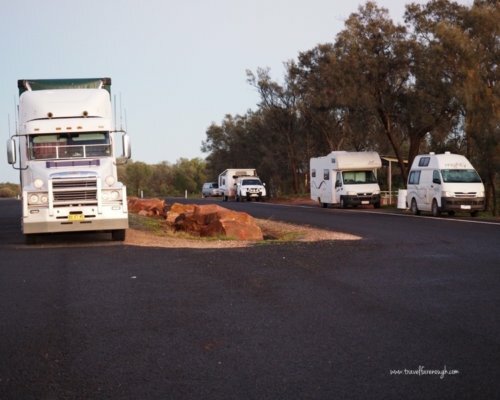 Our idea was to take advantage of a parking lot in Cobar we saw on the way through, which allowed campervans to park legally for a few days. It was getting to be late in the afternoon when we drove past a pair of Winnebagos parked next to the highway. A pair of couples were sitting around a campfire in lawn chairs enjoying drinks. “Now, that’s the way to do it!” we both said out loud—laughing. We didn’t know it at the time, but we’d get our chance. Night fell rather quickly with the dark gray sky. Driving at night in the outback is dangerous. 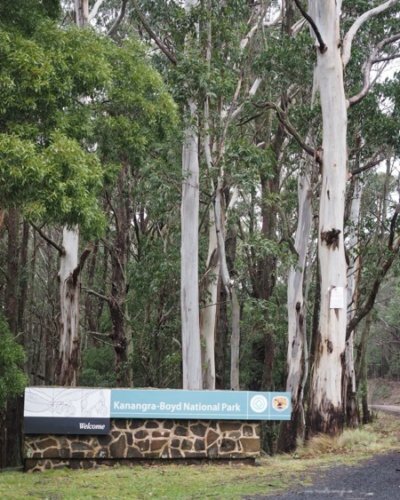 There was even a warning sticker in the campervan saying don’t do it because far too many kangaroos and wombats are out. We were still an hour from our destination and it was getting pretty hairy driving. Making matters even more dicey, our high beam headlights had the power equivalent to a hand held flashlight with weak batteries. As luck would have it, we saw three campers parked in a designated rest area so we pulled in with them. Even though it was right off the Barrier Highway, where we expected semi-trailers to come barrelling through every few minutes throughout the night, it was actually quieter than the Broken Hill campground (most campgrounds for that fact). The clouds were breaking up enough to (finally!) see stars. With a glass of wine in hand, we set up the camera on the tripod and took night shots of the sky before the full moon washed out the remaining light. Drifting off to sleep, I could hear nothing but the sounds of raw nature. The wind whispering through the trees, the bleating of goats in the pasture. (Feral goats are everywhere!) 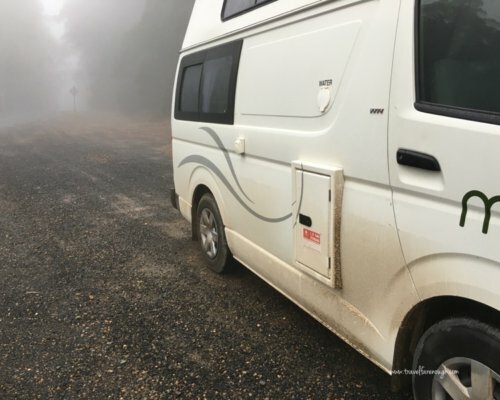 After we awoke from the most restful night of sleep I’ve had since moving to Australia, we crawled out of the van to discover a road-train had pulled in overnight. We never heard him roll in. Those truckers know better than anyone that those ‘roos can cause some serious damage! We love tent camping, but free camping in a campervan just suits our aging bones better. It’s easy to stay dry and warm and clean. We don’t have to worry about replenishing ice every couple of days since a built in mini fridge and freezer is included. Best of all, we can remotely park just about anywhere we want to. Wikicamps website – there is also an app you can download from the website for your phone.